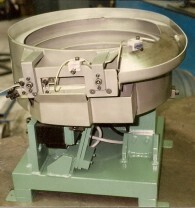 012 - CW Standard Screw Feeder Bowl Repair - 24 inch diameter. 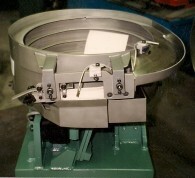 013 - CW Standard Screw Feeder Bowl Repair - 24 inch diameter. 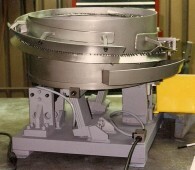 014 - CW Standard Screw Feeder Bowl Repair - 24' inch diameter. ​Photo 001: Is and 18" diameter counter clockwise standard screw feeder manufactured from 11 guage stainless steel material. 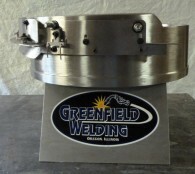 Photo 002: Is a 24" diameter counter clockwise outside tooled screw feeder. This bowl was a total rebuild. We even went so far to put a new bottom in this bowl. All new tooling, new coils on drive unit. This bowl spent most of its previous life on a #20 Hartford roll thread. 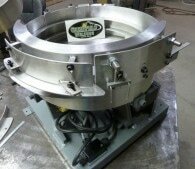 Photo 003: Is a 15" diameter counter clockwise standard screw feeder. 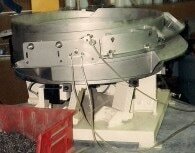 Photo 004, 005, 006: Are of a 15" diameter clockwise custom straight parallel screw feeder. This bowl was designed to feed head heavy blanks. These are blanks where the head is larger than the body, causing parts to want to stand on their heads. This feeder has a 1/2 tube section at the breakout that lays the part down and allows it to hang in the rails at a high feed rate. This bowl was built for a small EW Menns threader. Feed rates were consistant at over 500 PPM. 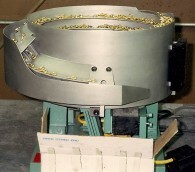 Photo 007, 008: Are of a 18" counter clockwise custom tooled feeder bowl made to feed brass eyelets into an assembly machine. Parts had to feed eyelets leading down a drop tube. 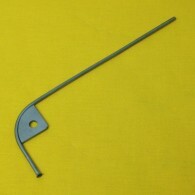 Parts were for a hook and eye assembly. Photo 009, 010: are of a 21" diameter counter clockwise airless screw feeder. We were feeding a #8 x .625 headed blank at 600 plus PPM without the use of any air. Note the open area where parts hang on the edge of the rail. This area allows unorientated parts to clean without the use of air. This was a high volume part and the customer wanted a dedicated bowl. Photo 011: Is of a 30" diameter clockwise outside tooled screw feeder. 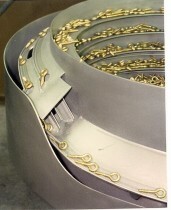 This size and type of bowl is very popular with the #20 and #30 Waterbury roll threads. Photo 012, 013, 014: Are of a 24" clockwise standard screw feeder repair. The fans were welded and reground and new rails wer installed as needed. The drive unit was gone thru and all spring and coils were checked. Our rebuild will make an old worn out bowl peform like new.